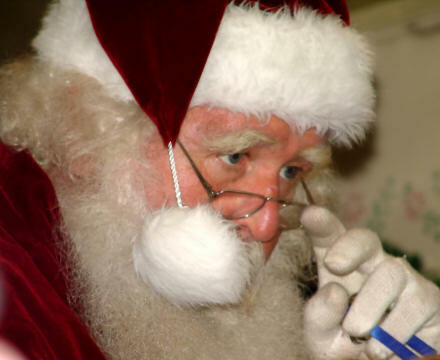 Santa is far too scary for children …?! The real™ Santa Claus, as spotted at stock.xchng. The world is going mad! It’s official. There is an article in today’s The Scotsman newspaper entitled “Santa is far too scary for children, says government”. The highlight of any Christmas party for generations of children has been the moment when the lights dim, voices hush and the sound of sleigh bells signals the imminent arrival of Santa Claus. But that magic moment has come under threat from government advisers who have told teachers that children should be protected from the “terrifying” appearance of Santa at school Christmas parties. Pantomimes are also regarded as psychological “scene of crime” sites, with teachers told to seat nervous pupils near an exit. Children should give “experiences” instead of Christmas presents and stop sending cards to cut waste, according to government advice. I’m not even sure that I fully understand what it means to give “experiences”, how is a child supposed to comprehend it?! Do they mean like wedgies, dead-legs or ‘Chinese burns’? Maybe bullying? Or an invitation to see Santa. I tell you, the world is going mad. …but Santa was never scary! It’s mad, all mad. Just like an office I know being told all to give money to charity instead of giving Xmas card. I mean, that’s alright and pretty nice thing to do, as an adult(! ), but not as a child. Next Next post: Who eats whom?